This journal I dubbed the forest book since its colours and general appearance reminded me of forests. 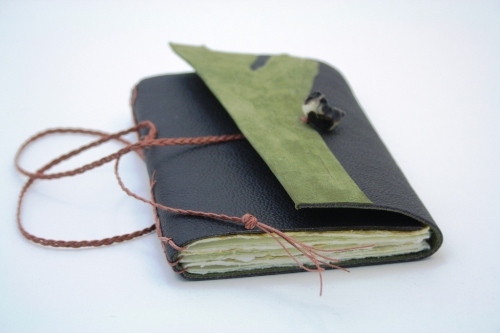 The cover is made from a piece of thick leather, lined on teh inside with thin green suede. The suede is turned around the fore-edge and thus decorates also part of the outside. The book closes by a braided cord and a horn button. The inside pages are pure cotton rag paper, decorated with nature prints of leaves I found near to where I lived in Bonn. The spine shows also braided sewing thread.